I love how people abandon their pets, then wring their hands and say how sad that they are that they didn’t have enough time/couldn’t find a place/couldn’t train it. Yes, I know that there are always exceptions where the dog and owner just aren’t working out, but I also think that in the majority of cases, the owner doesn’t want to work things out. Basically, they get a dog and then tire of it. This poor girl is so terrified at the shelter that she will not look at anyone. She stares at the back of her cage all day and all night long. If you can help out a senior that spent her entire life in a home environment and is now in a very scary place, please come meet her. Meanwhile, the dog knows no other life, has no inkling of other possibilities and, as in Katana’s case, is too old for most people to consider bringing her home. 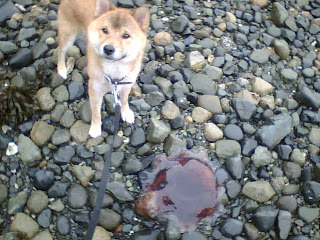 If Katana was in Nanaimo, I would probably be bailing her out on Saturday. Katana (via Petfinder) gets along with most other dogs, but really is not interested in them too much and she doesn’t seem to know what cats are (she could probably learn to live with them). She is an older girl and has a pretty low energy level. She is independent and it takes her some time to warm up to new people. Typical Shiba… she would probably make a great companion for someone who wants to go for sedate walks and just wants some company in the evenings. I would like to point out that Shassi is 15 and still in decent shape (for a 15 year old dog!) 5 years is a long time – a lot of people don’t keep their cars or houses that long! So, if you’re in the Philly area and looking for a Shiba, but aren’t sure that you can handle having a young one, why not consider Katana? What’s a short time for you is going to be a lifetime for her. You could make it a happy one. If you’d like to save Katana, e-mail natalie@phillypaws.org. The adoption fee for a PAWS dog is $40, plus an $8 city license fee if you live in Philadelphia. The fee includes spaying/neutering, which will be performed before your new companion comes home with you, and microchipping. Also, make note of Katana’s ID number above, and bring it with you when you go to the PAWS shelter, which is located at 111 West Hunting Park Ave (map).